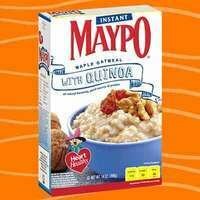 Instant oatmeal isn't exactly groundbreaking, but this stuff has quinoa in the mix! That nutrient-packed seed brings a boost of fiber, protein, and all 9 essential amino acids. And the serving size is nice: it cooks up to about a cup of hearty goodness. One super-filling hot breakfast, coming right up! Click to locate ASAP. Brand-spanking-new snack alert! This flavor just hit store shelves last week, and we snapped one up right away to chew 'n tell. This bar has a classic Quest chocolate base, studded with almonds and white chips. Sooooo yummy! 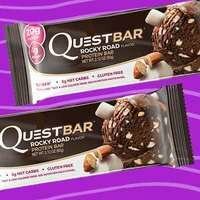 We're Quest Bar fanatics: perfect nougat-like texture, decadent taste, impressive fiber and protein counts... This newbie fits right in! Find it in stores or order online. These snacks appeal to us on many levels. The part of us that's focused on health loves that they're made with grains and veggies (corn, sorghum, tomato, beets, etc.) 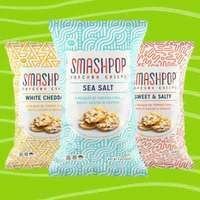 The part of us that's focused on chewing delicious things loves the crunch and mouthwatering flavors: Sweet & Salty, White Cheddar, and Sea Salt! These treats are brought to us by the folks at Snikiddy. Check where Snikiddy products are sold, and stock up! The future of snacks? Bugs! Don't take it from us, take it from Indra Nooyi, the CEO of PepsiCo. Ten years ago, she and her team accurately predicted that Americans would make a massive shift toward healthy eating. This time, she's forecasting that crickets and other bugs will take center stage in the future as an inexpensive protein source. What do you think of this trend? Would you eat cricket-infused protein bars? Take our quickie poll now! Drink coffee now, prevent dementia later. This is good info, especially if you're sipping a cup of java as you read this morning's news. A recent study suggests that higher than average caffeine intake could prevent dementia and other age-related cognitive impairment. It's always nice to hear about something enjoyable we can do to maintain our health. Bottoms up! Worth ordering online: FitVine Wine, with under 100 calories per glass! Get this: According to the company, FitVine wines have more antioxidants and fewer sulfites than traditional wine, plus they’re lower in carbs and contain no residual sugar. And a 5-oz. glass has just 90 - 95 calories! We tasted all three varieties: Cabernet Sauvignon, Sauvignon Blanc, and Chardonnay. They're a bit mild in flavor, but we like 'em! If you're a wine fan who's looking to save calories and sugar, you'll want to place an order and check these out for yourself. That’s all we’ve got. ’Til next time… Chew the right thing! It's National Bittersweet Chocolate with Almonds Day, November 7th. We're reaching for a 120-calorie pack of Dole Banana Dippers with Almonds. They're banana slices covered in dark chocolate and almonds! A new Quest Bar, a bug trend, and low-cal wine? Click "Send to a Friend," and start a conversation with your pals!